Visit http://canirmalg.wordpress.com/xbrl/?for my conversion tool on XBRL and other files. XBRL is the buzz word today in our professional fraternity. together these fragments to frame a picture called XBRL. XBRL is the buzz word today in our professional fraternity.Why not,‘The Companies (Filing of documents and forms in Extensible Business Reporting Language)Rules,2011’has mandated filing of annual reports of specified class of companies using XBRL and as always,something new,a jargon probably never heard before,has been thrown at us to comply with. In the following paragraphs,we try to unravel this mystery and solve the puzzle –answer a few basic questions –Why,What,Who,How and Where –put together these fragments to frame a picture called XBRL. Every entity,commercial or otherwise,is required to prepare and present one or more financial reports to showcase its activities or operations and its financial standing.However,the Financial Reporting model today involves manual processes and is rather disjointed. Even in the era of advanced automation and Electronic Data Processing,applications or computer servers seldom interact outside their periphery,because different applications have different data structures and generate reports in closed formats (word,excel or pdf)i.e.,to say,the output of one application is not automatically input in another application for further processing.This gives rise to manual extraction and re-entry of data which is laborious,error prone and adds no value. The users of financial information –regulatory authorities,stakeholders,lenders,etc.have differing requirements.This leads to a disjointed system of financial reporting requiring the preparer to prepare multiple financial reports for different users. Consequentially,more time &energy is spent on data mining and data gathering and less is spent on data analytics.With XBRL,we intend to reverse this. To begin with,XBRL is an abbreviation for eXtensible Business Reporting Language. XBRL is an Open Standard XML based language for electronic communication of business and financial information and on the Internet. However,XBRL is a more powerful and flexible version of XML which has been defined specifically to to meet the requirements of Business &Financial information. Conversion of Financial Information into XBRL involves tagging of Individual elements or item in the financial report (Concepts)for their electronic dissemination. These concepts are defined in a Taxonomy based on a Common Accounting Framework (say,Indian GAAP,IFRS or US GAAP,etc. ).Thus,Taxonomy is basically a Dictionary of financial reporting terms or concepts.Since national jurisdictions have different accounting regulations and accordingly separate Taxonomies are developed for different reporting purposes such as Indian GAAP Commercial &Industrial (C&I),IFRS,Bank Regulatory reporting,etc. XBRL is an Open Standard and is thus free of all licenses and royalty.It is also software and application independent.However,here lies the catch –basically,the Taxonomy or the Data Standard is free –the tools and applications to convert and /or view the Financial Report are developed by proprietary software vendors and are accordingly subject to a license fee. 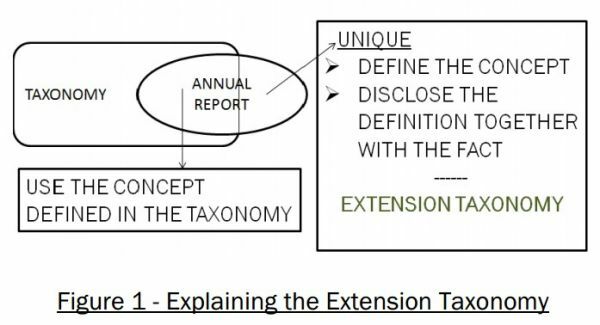 XBRL is extensible.Each entity’s business operations have unique aspects of reporting.An EXTENSION TAXONOMY allows a company to create and customize concepts and elements for their particular reporting practices.Extension taxonomies import then build on,or “extend”the core reporting taxonomy. This characteristic of extensibility of XBRL provides it with the much needed flexibility and adaptability to differing accounting environments.Without extensibility,XBRL would have been a mere standard chart of accounts.